Please join us for the Opening Reception on Friday, February 8, 2019 from 6 to 9PM. Anthony Holdsworth was born in England and embarked on a painting career while working as Head of Outdoor Restoration for the Uffizi Gallery in Florence, Italy. He continued his studies at the Bournemouth College of Art in England, and then the San Francisco Art Institute. Originally a landscape artist influenced by the Bay Area Figurative Art movement, Holdsworth began painting plein air cityscapes near his Oakland studio. Eventually he made his way to San Francisco’s Mission District, as well as more detailed renderings. He has shown with major galleries through California and has been a recipient of the WESTAF-NEA fellowship. Holdsworth lives in San Francisco, and works both there and in Oakland. t.w.five works with just one material — vinyl — and focuses largely on process. All shapes are hand-cut to size from large rolls of solid color vinyl, and then carefully applied to a surface of the work. Each work is made of intricately repeating patterns, which require hours of rigorous work. The finished product is a labor of love, weaved and realized by two sets of skillful hands. Born and raised in Sweden and Brazil, respectively, t.w.five is an international art duo based in San Francisco, California. 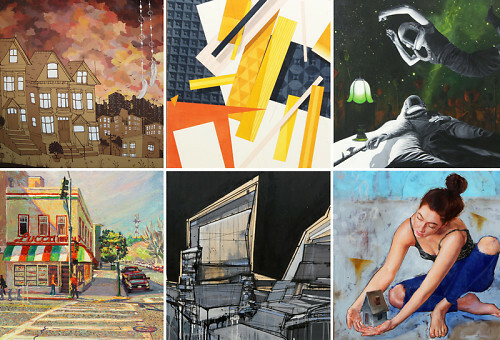 Each artist holds a Masters of Fine Art from San Jose State University and have enjoyed numerous solo exhibitions in the Bay Area and abroad. Chris Stokes uses mixed media to interlace and layer unassuming combinations of color, lines and found materials. Elements from literature, cultural symbols, and architecture meld together to become art that equals more than the sum of its parts. Born in Philadelphia, the long-time San Francisco resident’s recent work is a reflection of his travels, his ever-evolving perspective of the world, and an interest in science fiction. The resulting pieces represent new landscapes and structures that seem barely possible. Daniel Chen is an oil painter based in San Francisco. His current body of work explores the way this technology has affected our visual language and shapes the way we think and remember the past. He holds a BFA from Academy of Art University and an MFA from California College of the Arts. St. Monci meanders through the purely gestural and technical applications of abstraction, utilizing his training in street and studio art to create compositions that address perception and matter. He explores the most fundamental elements of art and design, in color and form, and how they relate to each other and the viewer. Dynamic matrices of architectural and graphic elements evoke a visceral reaction to otherwise static elements of flat shapes. St. Monci was born in the United States and raised in Puerto Rico. He returned to earn his BFA and MA at New York State University Oswego and is now based in Rochester NY. Alice Wiese is an emerging textile artists based in Berkeley. She draws inspiration from patterns found in architecture as well as themes of grief, loss, change, and the process of rebuilding oneself. Her highly repetitive and detailed work is simultaneously chaotic and calming. Wiese received her BFA in textiles from the California College of the Arts and has traveled to Australia and Japan to learn about different textile techniques, fabrics, and fibers. As a New York-based artist, Evan Venegas uses imagery that is loosely based on the urban, industrial landscape that surrounds him. His creative process is rooted in the recognizable world but expressed by abstract shapes and vibrant colors. He seeks to create an experience that inspires a change in perception for the viewer. Venegas began painting with oils at a young age, and started developing his technique, of realistic rendering of imaginary objects, in his early teens. Born and raised in Queens, New York, he began his art education at Parsons School of Design, then moved to San Francisco to complete a BFA in Painting at the San Francisco Art Institute. He returned to New York in 2000. Kevin Earl Taylor is an oil painter who examines the chaotic and incomprehensible human paradigm through the exploration of animals and nature. He studied at the Savannah College of Art and Design, and lives and works in San Francisco. Joshua Lawyer is a self-taught artist with a background in painting on walls that didn’t belong to him. He now depicts beautiful women juxtaposed against the gray industrial backgrounds that inspired him. He was born and raised, and still lives and works in the Bay Area. Bunnie Reiss is a muralist and fine artist whose work is heavily influenced by her Easter European background, with its tradition of folk art, saturated colors, animals, nature, and community engagement. Her extensive travels add an extra layer of conversation, which make her creations extremely unique. Her murals and larger installation work are looked upon as spell, an offering, and a place for people to gather. She has exhibited in galleries and created brightly colored murals through the US and around the world. She currently splits her time between Los Angeles and Joshua Tree. Jet Martinez reinterprets Mexican folk art into a distinctive urban contemporary style that is manifested in both large-scale murals and fine art. Flat and graphic in manner, his use and application of color create vibrant, static imagery that celebrates life at its most ecstatic. Originally from Veracruz, Mexico, he is a graduate of the San Francisco Art Institute and currently lives and works in Oakland CA. Kelly Tunstall's portraits are stylized female figures in adapted environments: nests built of painted boards held together by drawn nails or far off planets. The physical form and its accompanying exterior become a mirror for internal thought processes and turmoil. Working in acrylic, collage, spray paint, pencil, pen and ink, gold leaf and some secret sauce, her experimental yet classically grounded works live comfortably in a space between graphic expression, stylized representation, surrealism, and sketch. The patina of age and calligraphic drawing methods lend further depth to her story-filled worlds. She received her BA from California College of Arts and Crafts in 2002. Amandalynn is a San Francisco-based muralist, fine artist, conservator, and art director. Inspired by the female form and spirit, she depicts strong, seductive women and illustrates their strength through line work and decorative patterning. Her work can be found in galleries and streets all over the world. She began developing her distinct street art style mural work in 2001, painting alongside infamous graffiti collective The Seventh Letter. She believes that sharing the creative process with others is the key to an inspired life. Amandalynn has a Bachelor's of Fine Art from the San Francisco Academy of Art. Robert Bowen has been exhibiting his artwork throughout the US for over fifteen years. Bowen got his start through graffiti and street art, briefly attended art school, and continues self-schooling to obtain a classical education as a painter. He lives and works in San Francisco. Damon Soule was born in Atlanta, GA but spent the majority of his childhood in New Orleans LA. In 1993, Soule moved to San Francisco with a packed bag of clothes, a small box of art supplies, and $300. Inspired by physics, chemistry, music, and universal knowledge, his work incorporates a bold use of saturation and composition, and is a visual manifestation of the intellectual quandaries he explores on a regular basis. He moved to New York and Portland before returning to San Francisco Bay Area in 2011. Reuben Rude is the child of hippies who met in San Francisco during the Summer of Love. He grew up in the woods of Northern California and came back to San Francisco to study at the Academy of Art. He utilizes his expertise in drawing, painting, and illustration in both the creative and commercial realms, having shown in galleries, comic books, and magazines throughout the world. When he is not making art, he is working on his 100-year-old house.